We sit down with Nang, who makes up one half of the name behind Cameron’s kitchen. We explore the human side of what it means to be a passionate foodie, mum and businesswoman. In a world where work, school and family life all blur into one, Nang reminds us to enjoy each day as it comes and to make the most of the time spent with the ones we love. Q: What sparked the idea for a meal delivery service? Q: What motivated you to create Cameron’s Kitchen? A: “Those conversations with the parents were more than enough. I felt the same way. Another reason, personally for us, is that on the weekend we like to go out on the boat. I used to cook dinner and breakfast on the boat, so every time I was preparing to cook, I had to ask Malcolm to get the gas set up, and then food would splash everywhere if I did a stir fry. After cooking and eating, I had to wash pots and pans and clean up. I thought, gosh this is hard work, this is not relaxing [laughing]. I was exhausted by the end of the night, I started to feel that I didn’t really like going out on the boat anymore. In the morning, cooking scrambled eggs, I thought here we go again, setting everything up. Malcolm and James were too busy catching fish and crabs to help, or maybe they use that as an excuse [laughing]. It’s supposed to be a relaxing time in the morning; sitting on the boat with a coffee, watching the water, and the birds flying in the sky. Q: You’re clearly passionate about food; where does that passion originate from? “Growing up in Thailand, our culture is revolved around food. Oh, we just love sharing food! And every time somebody is getting married, the whole village would come together and cook up a storm. It's so colourful. Everyone is happy and laughing. Eating food together, and of course everything was fresh. If someone needed something, someone would run to their back yard and grab some fresh herbs. Q: When did you know creating Cameron’s Kitchen was the next step for you and your family? 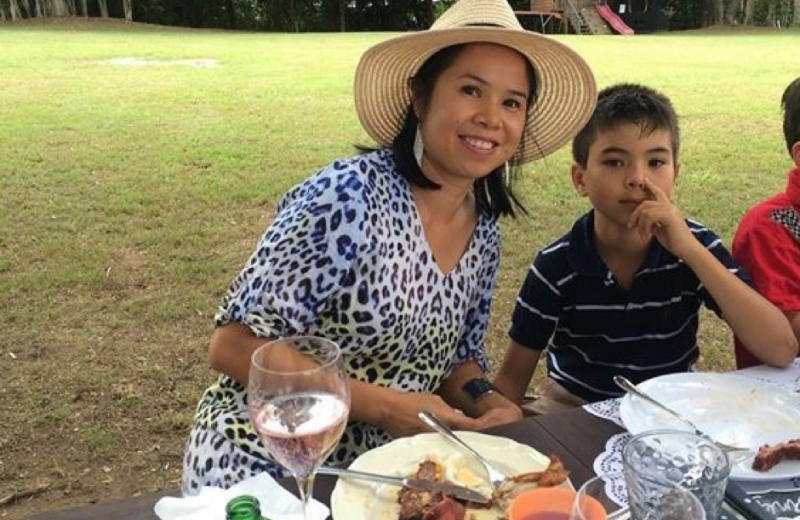 “We moved from Brisbane four years ago, and we had good neighbours, so every time I cooked up something, Thai food, you know, I would invite my friends and my neighbours to come along. We had a great time. My friends and neighbours would say, ‘Nang, you should open your own restaurant’. Well I love food, but the thing with restaurants, is that you have be there 24/7, so if you want to spend more time with family, that’s not the answer. Q: Do you eat Cameron’s Kitchens meals at home? “Yes, sometimes I take meals home with me, and I like to put my feet up, have a glass of wine, relax and chill out. Our friends, a family of five from Brisbane, came over to visit us not too long ago. Because I wanted to spend time with my friends, I brought meals home with me. They have three girls, they were like, ‘oh I want a stir fry’, and ‘oh I want this…’ - they got so excited [laughing]. It was the first time that I actually felt relaxed whilst entertaining, without running in and out of the kitchen. Every time I used to make a curry, we would sit out on the veranda, and I would run in and out of the kitchen and stir the curry or make sure that the rice was cooking okay [laughing]. But it was exhausting, and I missed out on the conversations. And I thought, this is not good, something needs to change. Q: What’s changed since you first started Cameron’s Kitchen? “We are learning over time that people prefer the variety of food, and they are also more conscious about what they are eating. At the very beginning, we started with the basics, and now we have expanded the variety with the vegan, vegetarian and gluten-free meals. We’ve also had a lot of phone calls from people who were diabetic, so based on that, the head chef Volker, he’s been developing meals that meet the requirements of this group of people. Q: What’s something that would surprise people about Cameron’s Kitchen? “Our fresh herbs. I enjoy gardening and cooking and using the herbs fresh from that garden. I feel happy when I pick them and give them to the chefs, and they use them in the meals. It’s so good, because I know that the herbs are fresh, free of chemicals, you know, and that makes me happy. Q: What are some of the biggest rewards of your role at Cameron’s Kitchen? Q: Has your son, James, noticed a difference in your lifestyle change? “Yes [laughing]. Normally we let him choose first, and he loves it. Because every day it's different. But he’s got his favourites, like Carbonara, Meatballs, and the Ribs, and he finishes the whole lot. It’s a big meal for an 11-year-old, and I can see that he is growing fast. Before I used to force him to finish his dinner [laughing], but like last night, he had Butter Chicken and he finished the whole meal. Q: What’s next on the cards for Cameron’s Kitchen? “Adding to what I said before, in one year, we might not realise that we spend hundreds of hours preparing, cooking, cleaning and washing up. I think we do need a break sometimes. Even entertaining friends - so we are planning to provide a BBQ pack or something similar, to make things easier for busy people who would like to enjoy more time with their friends. So, we’re thinking BBQ dishes and salad on the side. The reason that I would like to create a BBQ pack is to make things easier for entertaining. People won’t have to drive to meet someone at a restaurant, they can enjoy themselves in a home environment and have a glass of wine or beer, and it eliminates the cost of paying for a taxi and restaurant prices. Friday or Saturday nights would be perfect. We hope you’ve enjoyed learning more about the people behind the meals, and that you can now put a face to the name. A big thank you to Nang for sharing an honest insight into what it means to be human and balancing work and home life commitments. If you have any questions or suggestions, or would like to have a friendly chat, please don’t hesitate to get in contact with us on (07) 5522 0860.